I had posters of Carlton stars Stephen Kernahan and Craig Bradley on my bedroom wall and dreamed of joining them at Carlton. Michael O’Loughlin (or Micky O) was a 303-game and 2005 premiership star for the Sydney Swans. But he grew up dreaming of playing for Carlton and his dream almost became a reality. 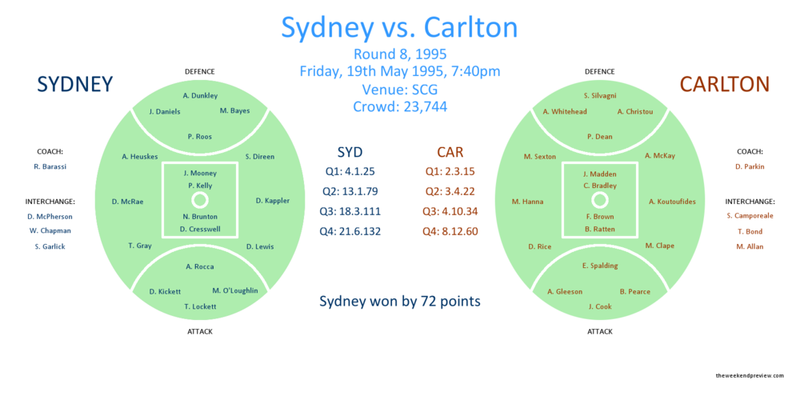 It wouldn’t take long for Micky O to cross paths with Carlton again – the SCG, Round 8 of the 1995 premiership season. Micky O was playing in only his 4th senior game and his Sydney team (2 wins – 5 losses) was coming up against the undefeated and raging premiership favourite, Carlton. The game is now remembered for many reasons, not least the 72-point thumping the Swans handed Carlton (one of only two losses for the whole season for the premiership bound Blues). The match was also a celebration of the then Sydney coach Ron Barassi’s 500th game as a VFL/AFL coach, with Carlton a fitting opponent as he had coached them to premierships in 1968 and 1970. Come game time, Sydney full forward Tony Locket (in his first season at the club) got into the celebratory mood by kicking 8 goals, whilst first-gamer Anthony Rocca had a fine debut. But it was the breakthrough performance of Micky O that has had the most lasting impact from that game. Micky O kicked 4 goals and earned himself a Rising Star Nomination for his efforts. A career was launched and at close hand the Blues got to see what they had missed out on. It would take another 10 years before Micky O tasted the ultimate team success of a premiership triumph, with the 2005 premiership ending a 72-year drought for the Sydney/South Melbourne Swans. But there is another honour that Micky O considers the equal of this premiership triumph, being named at Full Forward in the AFL’s Indigenous Team of the Century in August 2005. And the early front-runner for the Full Forward position in the Indigenous Team of the 21st Century would surely be Lance Franklin, the current Sydney superstar. Lance (Buddy) Franklin is now at the mid-point of his infamous 9-year, $10m contract with the Swans. But has he peaked as a footballer? Have we passed peak Buddy? In truth, there have probably been 3 peaks. Buddy of course started his career in the Brown and Gold of Hawthorn. His meteoric rise in his first 4 years at the club was simultaneous with the rise of his football club. Figure-1 presents Lance Franklin’s goals per game average for each season of his career. In his first 4 seasons he increased his goal average by over a goal per game, reaching a career high of 4.5 goals per game in the 2008 season (113 goals in total). In that same time Hawthorn went from 14th, to 11th, to a losing semi-finalist, to a memorable premiership triumph. And in terms of pure goal output, Buddy has never bettered his output from that 2008 season. The drop-off in Hawthorn in the immediate years after 2008 was reflected in the output of Buddy. Although by 2011, a year in which Hawthorn had returned to a Preliminary Final, Buddy had added a new dimension to his game, becoming a goal creator. Figure-2 presents Lance Franklin’s goal assists per game average for each season of his career. For goal assists, Buddy reached a career high in the 2012 season, a season that ultimately ended in a disappointing Grand Final loss. Although Hawthorn did taste that success 12 months later in the 2013 Grand Final win over Fremantle, Buddy’s contribution was marginalized. The general consensus was that Buddy would leave the club as a free agent at the end of the season and Hawthorn were already preparing a team structure to deal with post-Buddy. In his first season as a Sydney Swan in 2014, there was a jump in output from Buddy both in terms of goals and goal assists relative to his last year as a Hawk. But it is his change in role for the Swans that is becoming more noticeable with each passing year. Whilst still contributing on the scoreboard, Buddy is now being a provider from outside 50. 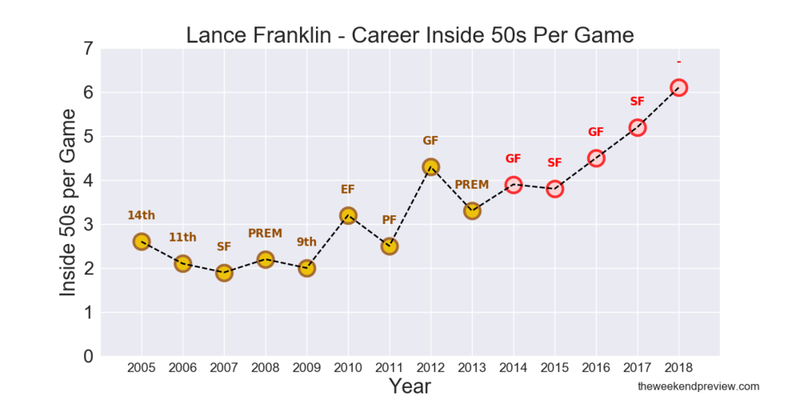 Figure-2 presents Lance Franklin’s inside 50s per game average for each season of his career. Since 2015, there has been a steady climb year-on-year in Buddy’s inside 50s per game, with 2018 representing a new high point. In 2018, Buddy is averaging per game 3.1 goals, 0.9 goal assists and 6.1 inside 50s. Buddy’s positional play is reflective in that only 34% of his possessions have been from inside 50 this year, with 53% of his possessions collected on the attacking side of the wing. Where does this peak end? Can Buddy lead the Swans to their next premiership playing this role? We still have got until 2022 to find out. But is Lance Franklin still the best key forward in the AFL? His start to the season was ominous, 12 goals in the opening 2 rounds. That was of course unsustainable, particularly in his half-forward role. But more than anything, he has been hampered with a lingering heel complaint in recent games, an injury that forced him to miss 3 matches between Rounds 6-8. This slump has allowed some of the competition to catch up. A key forward should be judged on their ability to kick goals and create a presence in their team’s forward half, judged qualitatively and quantitively by either by taking contested marks or marks inside forward 50. Played a minimum of two-thirds of matches this season. After Round 10, a player would need to have played 7 games to be under consideration. Based on the above, Figure-1 presents the AFL Key Forward Rankings after Round 10. At the top of the rankings is Jack Darling, a clear standout with his 2.8 goals per game, 3.1 contested marks per game and 3.5 marks inside 50 per game. Lance Franklin holds onto second position, which is not bad for a forward flanker. Considering an All-Australian team with only two key forwards, Ben Brown would be the unlucky one to miss out. Note: This article represents a continuation of a series of articles to determine the form players of the competition in each position. The premise is to assess each position based on an easily identifiable collection of variables. Each week the rankings will be updated and an All-Australian team will be auto-populated and presented on a stand-alone page. So far, metrics for key forwards, wingers, attacking halfbacks and key defenders have been developed. Much has been made of the fact Carlton undeservedly have a disproportionate number of Friday Night games this season. And the expected lop-sided encounter with the Swans this Friday Night has just added fuel to the flame. Carlton is expected to have done well if they can get within 10 goals of the Swans. That sounds about right. Perhaps Buddy can kick a bag. O’Loughlin, M. & Main, J. (2012).“Micky O”. HarperCollinsPublishers Australia.